A surgeon performs surgery on a synthetic dog. Should veterinarians learn surgery on live animals? Do they even need to? This week I had the opportunity to perform surgery on a completely artificial dog. A high-fidelity model which simulates the feel of real tissue, has a pulse and will bleed if you cut blood vessel. What is the point of this? Veterinarians perform surgery regularly. It’s not acceptable to learn on patients. For many years, veterinary schools around the world relied on the use of animals like dogs or pigs for terminal surgeries. If it’s not acceptable to learn surgery on a patient, how is it any more acceptable to learn on another animal? This is greatly reduced, due largely to a combination of growing community concern about the welfare of animals used in teaching, an increased number of veterinary students and faculty conscientiously objecting to the use of live animals in teaching, and by into the “3Rs” of animal use – replacement of animal models where possible, reduction of numbers used and refinement of technique. There has also been better education and training of the educators – there is a growing recognition that surgery is a complex procedure which can be broken down into finite, trainable skills, many of which don’t need to be practiced on a patient at all. I don’t tend to post on surgical topics so often here, because it’s an open site, but please note the photos below do NOT involve a real animal. The patient does, however, appear realistic and therefore the images may be distressing. Please use your discretion before scrolling down. When I started veterinary school in 2000 at the University of Sydney I was very fortunate. The use of alternative models to live animals was actively being explored and I did not perform terminal surgery on live animals. We learned how to suture on sponges. We performed surgery on cadavers. It wasn’t the same as performing surgery on live animals, but allowed us to develop and hone our skills. Of course another key component of learning surgery is scrubbing in and assisting an experienced surgeon, and I had a lot of opportunity to do that. Synthetic models have come a long way since I was in vet school. The Syndaver Surgical Canine, a synthetic canine model, is a remarkable example of such an alternative. 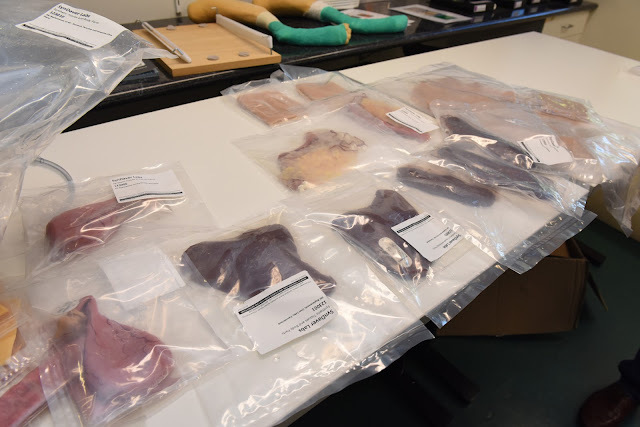 It contains replaceable, very high-fidelity organs (a bladder which contains bladder stones, a small intestine which contains multiple areas of necrosis and some foreign bodies, a spleen, a uterus and ovaries, a liver and so on. Dr Laurenci Brunel removes a "urolith" via a cystotomy on a simulated canine patient. When I walked into the room it was kind of eerie. This was anatomically very similar to a real dog, and the circulation was impressive. A surgical specialist colleague scrubbed in and rapidly performed a cystotomy to remove bladder stones, and a splenectomy (we usually perform those to remove splenic masses). 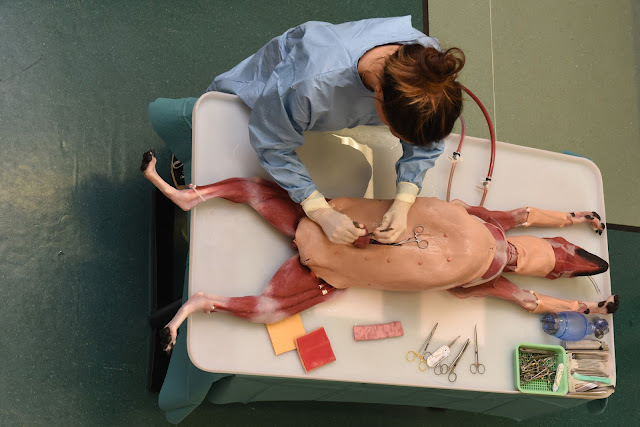 Other abdominal procedures which can be performed in this model include a gastrotomy with foreign body removal, gastropexy, liver lobe biopsy, partial liver lobectomy, enterotomy and foreign body removal, intestinal resection and anastomosis, intestinal biopsies, and of course ovariohysterectomy (surgical desexing). I had the privilege of undertaking a partial OHE in this model and it felt real. The manufacturers have managed to simulate the feel of the ovarian ligament, and even the broad ligament has built in fat. The blood pressure can be turned up and down. I cut the ovarian artery on purpose (this was challenging as it went against my grain), and sure enough, it bled (I then clamped it). 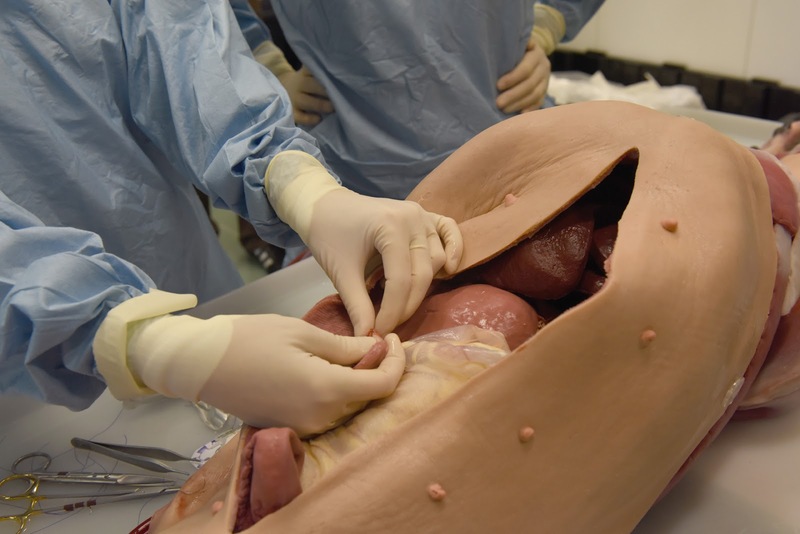 The model also facilitates intubation, tracheostomy, mammary mass removal, skin and muscle suturing, intravenous catheterisation, chest tube placement, and surgical haemostasis. Models like this don’t come cheap. They tend to be sold in a package with replacement organs, each of which retail for around $150USD each. High fidelity surgical models cost money. These can’t be mass produced. But the learning experience is impressive. If I could spend a weekend with a surgical tutor and one of these models, performing all of these surgeries, I would feel confident exploring new techniques. But as an undergraduate student, such a resource would have been invaluable. This model can be customised to meet specific requirements. The costs may be prohibitive for small institutions, but as more institutions, organisations and individual use alternatives like this, the less costly they will be. And that is a good thing for both animals that might have been used in teaching, and future patients. 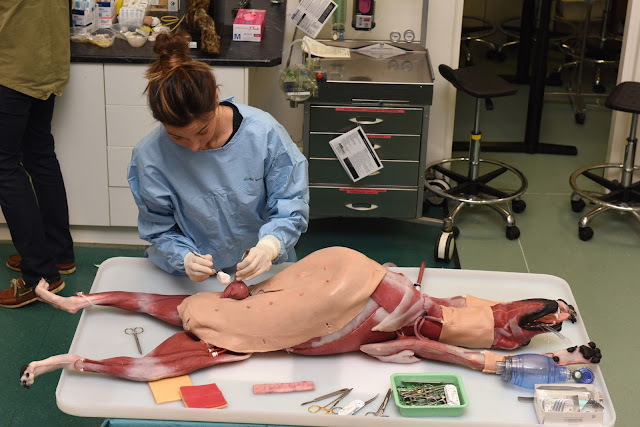 You can find out more about the Syndaver Surgical Model here. In other news, the Australian New Zealand College of Veterinary Scientists is conducting a survey of veterinary students about memberships here and one for veterinarians here.